For the fifth consecutive year, Kendra Scott and her team have created two astonishingly beautiful pieces for Art Bra® Austin. The Austin-based designer, who founded her self-titled jewelry collection in 2002 with $500 in the spare bedroom of her home, remarks on how Art Bra Austin is a unique event not only from an artistic standpoint, but for what it does to help the local breast cancer community. Every Art Bra submitted by Kendra Scott is assembled by hand by one of her talented designers, and is truly one-of-a-kind. We are beyond grateful for her continued and generous support and we’re delighted to share more details about her contributions for this year’s show! Kendra’s love and adoration for her late friend, Holley Kitchen, shines through in this piece, her most intricate design yet for Art Bra Austin. Throughout her battle, Holley served as an inspiration not only to Kendra, but to women diagnosed with breast cancer across the country. In a home-video that went viral, reaching over 52 million views, Holley aimed to educate people about Stage IV breast cancer and in turn, sparked a global conversation around what it means to live with a metastatic disease. To memorialize Holley in the grandest way possible, Kendra chose to incorporate 500 opulent custom-cut stones in her art bra’s design. 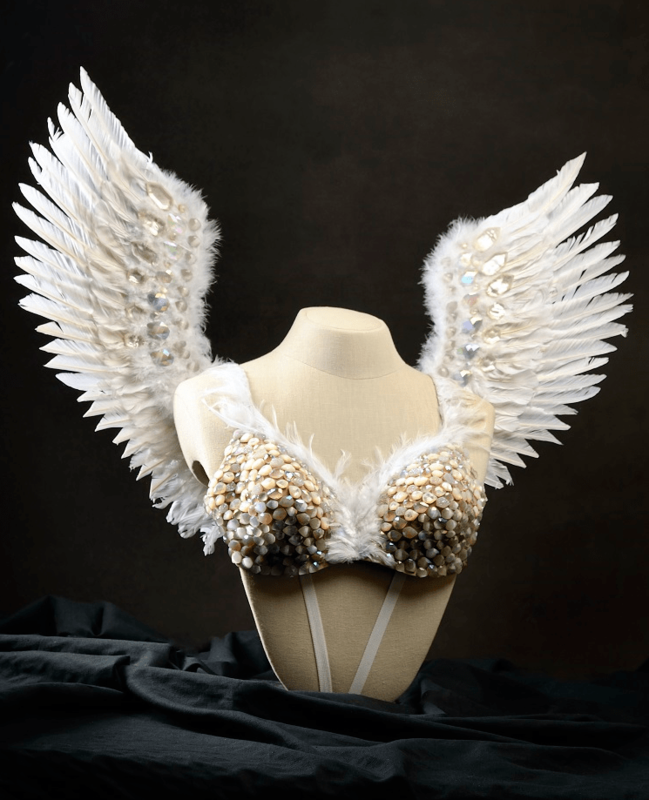 The bra and accompanying wings are embellished with ivory, mother-of-pearl, iridescent drusy, and iridescent slate. The design on the cups resembles angel wings because Kendra believes Holley is free now of the worry and pain that came with her diagnosis, and watches over us from a much better place. Every feature of this Art Bra was handcrafted in Kendra Scott’s design studio in Austin, Texas. The bra is a combination of editorial pieces from their Summer 2016 Collection and custom features designed especially for this Art Bra design. The “Chain Effect” bra includes a custom belt, shoulder pieces, and accessories (necklace, brooch, earrings, rings & bracelets.) All the accessories included in this design are editorial pieces from our Summer 2016 collection. Visit the official Kendra Scott website to check out more of her jewelry collection. To read more about Holley Kitchen and her impact on the metastatic community, read her spotlight story on A Story Half Told.